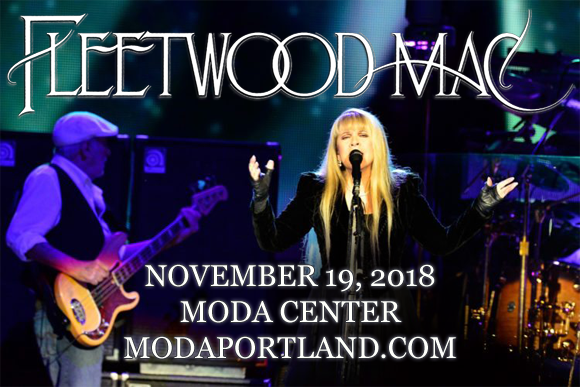 One of the world's biggest bands comes to Moda Center on Monday 19th November 2018 in a new incarnation! Fleetwood Mac are embarking on an extensive North American tour this summer, with an exciting line-up of Mick Fleetwood, John McVie, Christine McVie, Stevie Nicks and guitarists Mike Campbell (Tom Petty and the Heartbreakers) and Neil Finn (Split Enz and Crowded House)! “Fleetwood Mac has always been about an amazing collection of songs that are performed with a unique blend of talents. We jammed with Mike and Neil and the chemistry really worked and let the band realize that this is the right combination to go forward with in Fleetwood Mac style. We know we have something new, yet it’s got the unmistakable Mac sound,” said Mick Fleetwood of the new additions to the band. One of the best-selling bands of all time, having sold over 100 million records, Fleetwood Mac are a British-American rock band, formed in London, England in 1967. Primarily a British blues outfit when they began, the group was founded by guitarist Peter Green, drummer Mick Fleetwood and guitarist Jeremy Spencer and they released their self-titled debut album in 1969, finding success with their 1968 UK number one hit single "Albatross". After several changes in line-up and musical direction throughout the 1970s, the band released their biggest album to date, Rumours (1977), one of the best-selling pop albums ever, which launched four top-ten hits and has now sold over 40 million copies worldwide. As of 2018, the band's line-up consists of Stevie Nicks (vocals), Christine McVie (keyboards, vocals), John McVie (bass guitar), Mick Fleetwood (drums) and guitarists Mike Campbell, formerly of Tom Petty and the Heartbreakers, and Neil Finn, formerly of Split Enz and Crowded House.